The Legion was first only open to women; the first men apart from Duff himself joined it in 1929. The legionaries first started out by visiting hospitals, but they were soon active among the most destitute. Frank Duff subsequently laid down the system of the Legion in the Handbook of the Legion of Mary in 1928. The Legion of Mary soon spread from Ireland to other countries and continents. Pope Pius XI expressed praise for the Legion in 1931. Most prominent for spreading the Legion was the Irish legionary Edel Mary Quinn for her activities in Africa during the 1930s and 40s. Her dedication to the mission of the Legion even in the face of her ill health due to tuberculosis brought her great admiration in- and outside of the Legion. A canonization process is currently under way for Edel Quinn and a beatification process is currently underway for Frank Duff. 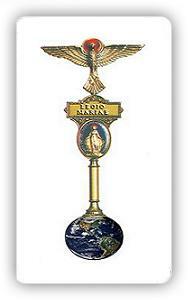 The Legion spread throughout South America in the 1950 with the work of another Irish Legionary, Alfie Lambe. 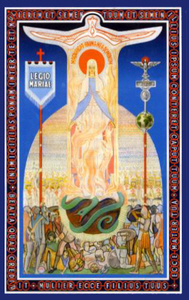 The Legion of Mary is a movement of lay Catholics who, with the sanction of the Church and under the powerful leadership of Mary Immaculate, Mediatrix of all Graces, serve the Church and their neighbor, on a voluntary basis, in about 190 countries. The object of the Legion of Mary is the glory of God through the holiness of its members developed by prayer and active co-operation, under ecclesiastical guidance, in Mary’s and the Church’s work of crushing the head of the serpent and advancing the reign of Christ. Members of the Legion of Mary become instruments of the Holy Spirit through a balanced program of prayer and service in a family atmosphere. Works include door-to-door evangelization, parishioner visitation, visitation of the sick or aged, Catholic education, visiting the newly baptized, visiting families, and meeting the other spiritual needs of the parish community.